Beyoncé Giselle Knowles Carter gave us a transcendent performance of "Love Drought" and "Sandcastles" at the Grammys this past weekend, her stage a last supper table in the midst of a garden, her dancers disciples, her pregnant belly the star of the night sky. To me, Beyoncé is an invitation for black people to see our miraculous nature in this moment when black lives in particular, and all that lives on our planet, are in a precarious position due to the theater of racism, fascism and patriarchy spreading across the globe. She embodies our continuation, the black bodies that birth us. This latest offering landed in me as a decidedly black speculative, or afrofuturist, performance. The black speculative arts movement encompasses science fiction, fantasy, comic books, horror and other imaginative work from black creators. Afrofuturism looks at explicitly future focused work from descendants of the African diaspora. I use these terms interchangeably because I am anti-label and want as large a territory as possible when exploring visionary fiction and art that asserts a future and/or an alternative for black people. Beyoncé picked up on, and in many ways deified, elements she introduced in her visual album Lemonade, for which no awards shows have appropriate categories. Rather than selecting one path to traverse, she claims her creativity at a complex intersection of her own determination, in the spirit of afrofuturists Sun Ra, Prince, and Janelle Monae, who each, in their time, articulated futures that could handle their whole, uncompromising blackness. The two most obvious paths at that intersection are Christianity and Yoruba, a religion with roots in West Africa and lineage throughout the Caribbean, South America and the US, which asserts children of the diaspora as beings with a destiny interconnected to the planet. 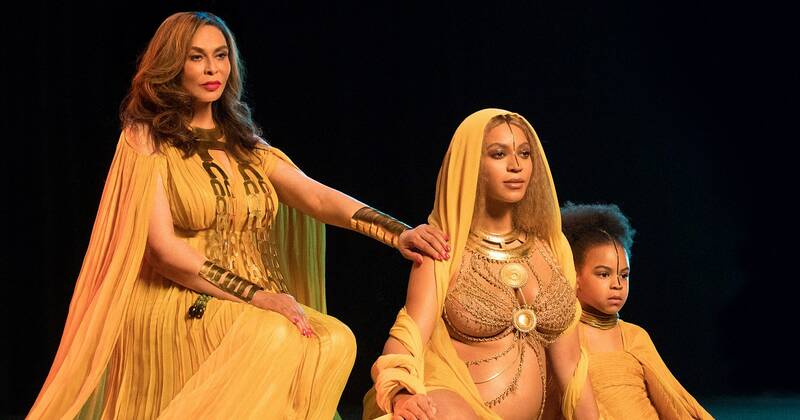 Beyoncé appears to us first as her bare, pregnant belly, draped gold threads over her luscious Oshun curves, rooting into the fierce, love goddess realm she embodied in the video "Hold Up" on her visual album. On her head is the flowered sun-ray crown of the black Madonna, in a Last Supper setting wherein, according to poet and writer Marvin K. White, she " reimagines the foretelling of Christ's pending death and resurrection, reimagines his impending slaying of life and death. Her performance speaks of the incarnation, not as God becoming a man, but as God becoming a uterus, becoming a woman to give birth to the God self." She, shifting shapes, is the all encompassing creative force that afrofuturist protagonists often become, one part superhero, one part god: Octavia Butler's Lauren Olamina, Tananarive Due's Fana, Nnedi Okorafor's Akata, Beyoncé's slay-all goddess. 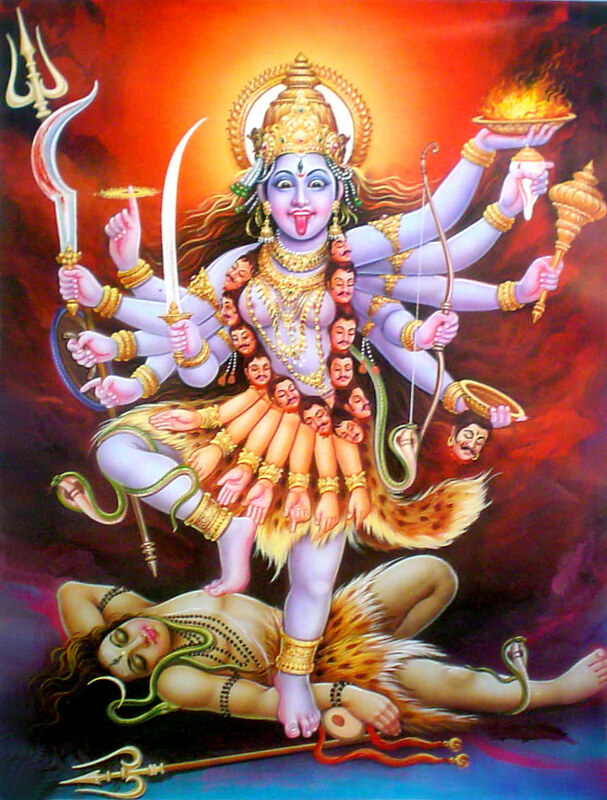 In one moment cloth flies out around her head, a Medusa daring us to look upon her glory, her many arms reaching out to gather awe, a conquering Kali. She makes her own arms, her own body, an instrument. Shifting between projections and the material stage, she lets us know that she is in charge of what is real in this moment, the journey and destination are hers, in the lineage of Alice Coltrane. She is surrounded by women moving like water, dancing backwards, multiplying into an infinity of black femininity, loosening us up from linear time and into the cyclical flow of creation. Beyoncé is pregnant with twins, equal parts Mother Earth and Venus on a fecund planetary stage that dismisses the boundary of indoor and outdoor—the implication is that she is also pregnant with the next world. She is full of black children, and they run around her, one, then three, then more—she is an embodiment of black future. She is of a trinity of women, flanked by her mother and her oldest daughter, Blue Ivy, and then she herself is multitudinous as she moves across the stage, solidifying at her own pace, sauntering down the table to the birthing chair in a gold neckpiece that evokes Maasai beadwork as her sisters fall into ecstasy in her wake, rolling themselves along the table after her. She rocks back on her simple throne, appearing to levitate in a classic birthing pose, and the stage becomes her P-Funk mothership; she is beyond gravity. When she touches her feet to solid wood again she is Oshun in an ocean of women, rocking their hips to prepare for life coming. The author is co-editor of Octavia's Brood and author of the forthcoming Emergent Strategy: Shaping Change, Changing Worlds (AK Press 2017).